At UDS-R in Copenhagen during the Ask Ubuntu session one feature that consistently came up was foreign language support. This has been discussed quite heavily since the start of the Ask Ubuntu site and so far our policy has been English only questions and answers. Now that we've been at this for two years I would like to explore what the community thinks might be viable options to handling questions and answers posted in a foreign language. This is an attempt to gather feedback about different ways this could either technically or otherwise be achieved. Whether that means we create code, devise a plan for implementation, or discuss if there is really even a need for this. Your input is welcome! This question is meant to convey "How do we handle posts in another language" not interface language. The discussion around UDS was how can we solve this problem. I'd like to find people's inputs on different ways we can ask Stack Exchange to implement. Or arguments against this kind of idea. The Ask Ubuntu interface, which includes such things as the "Ask question" link, the row of buttons along the top of each page, etc. Actual question / answer / comment content itself. The interface will be relatively easy to translate - I can set up some sort of UserScript that loads a translation file and dynamically injects it into each page. Then I can throw something together on my website that allows users capable of translating into other languages to submit translations for individual UI items. As for the content itself, that becomes another story. I assume that "auto-translations" (using Google Translate or any other API / service) is out of the question. These services have little value for content that contains a lot of technical information anyway. Allow any language on the site and have the questions mixed together (possibly sorted by tag which would allow for hiding questions in certain languages). The drawback here is that only users who speak the language will be able to read the question and therefore answer them. Create a new site for each language (which would involve going through the Area51 process all over again for each language). How do you moderate a question in a foreign language? Moderators will be dealing with flags in foreign languages. How will they be able to resolve problems? I feel that this alone is a strong enough reason to continue with our "English-only" policy on the site. The second option (creating a new site) is really the only viable option as far as I am concerned. During the session a lot of good ideas and concerns were put forward. I think one idea that might work as a stop-gap for this community is employing automatic translations. By which I mean if a post is detected in a language other than English it's run through an automatic translation tool and formats the post (after numerous warnings to the user about non-English content) with both the English auto-translation and the original post text. Same would apply to answers, while comments would be either not allowed in other languages or simply let through since they're so volatile. This post is sort of a reply to Marco's answer. Instead of having to employ automated language detection tools, we could just have a checkbox at the end of the post to allow users to mark a post as non-English when necessary. 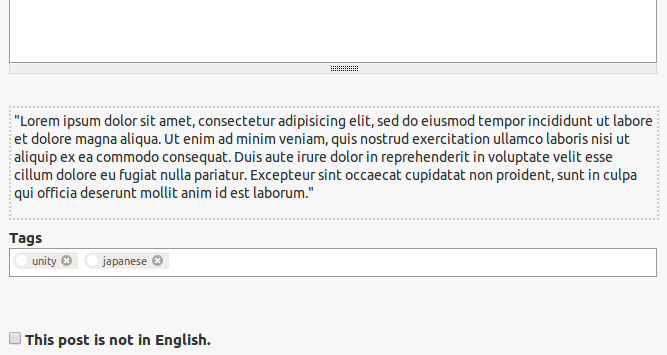 Another level of checkboxes may be implemented for the user to choose the exact language the post is in. These posts can then be channeled to a new set of review queue that people can use to translate posts to English. Filters based on the language might be a good addition too. I am suggesting this because most translation engines are still not up to the mark. Given only a very small percentage of posts are actually not in English, manual translations might work out just fine. While this will probably not get implemented due to moderation difficulties and slow implementation of engine changes(much longer than 6 to 8 weeks), I'm leaving this for reference and CW'ing it so future users can improve this idea if the functionality to fix it arises. Disclaimer: I've had to learn English as a second language, so my opinion here may be influenced by personal experiences. While posts will be in foreign languages, Stack Exchange could partner with a machine translator like translate.google.com and provide translations for untranslated posts. These, of course, are not ideal and should be replaced with hand-translations as soon as possible. If a bug can be filed to get error text to be given in English, and the user's language, at the same time, that would be very helpful. Strings, quotes, and parts of the post body even can be searched fr a translation through Launchpad translation data, culled and imported every month or so. Translation experts, avid editors, and native speakers can translate posts into English, and possibly translate answers for the OP as needed. Of course, we won't be able to translate every single post into every language for future users, but I feel as if the OP's language and English are enough. Flags can have a policy to only allow flags in English, except those without text related as part of the flag. I feel as if looking at the length of a post and punctuation/linking(question marks vs short posts vs things that look like "me too" or "thanks". We can also try to implement review queues for foreign flags. If a flag arises in a language which no moderator speaks, then if the mod deems it appropriate for a 2K or so review queue, then it will be sent, filtered by languages. We can also try to expand search by trying to use some sort of machine translation to search across languages. Maybe internal machine-translated English versions can be held in the database, and a foreign search will cause the query itself to be machine-translated and compared to the internal DB text. Query expansion, if used sparingly would also be a good idea. Scores (or user prefs) should be kept to see which users speak what languages, and how effectively. This can be done based on post-voting just as a user preference. Tags would need to get a new feature implemented: easier tag synonyms across languages. Currently, tags take a while to get synonymed. Tags synonyms across languages should be put in a review queue, and require not a score in the tag, but a score in that language (or understanding of the language as set by user prefs) should be required to make a synonym. I'd really love to see feedback on this, so vote or comment, whether voting up or down. I don't mind a downvote if I can hear personal opinion. We can keep one site, but use Area51 for a slightly different purpose. Instead of creating new sites, it will allow that language to be used on the site after passing a review and moderation success "beta", given enough interest in the language. @ObsessiveSSOℲ - There is an additional problem. If the user writes the questions with a very bad grammar (Like it happens a lot in english or spanish for me), the translator might go crazy and translate that into something even worse. The machine translation will only stick around until hand-fixed, either by tweaking the translation, or hand-translating. If the translation becomes offensive or totally incorrect, it can be brought up by sending to yet another review queue for translations. That's the trouble of a multilingual site. In the end, I feel as if this will help make Ubuntu more usable by all. We'll also start to see more moderation responsibility by mid-to-high-mod users, and a focus on multilingual elected moderators. Not the answer you're looking for? Browse other questions tagged discussion uds . Does Ask Ubuntu support the unity webapps feature? Do we support Ubuntu MATE?